The French scientist Paul Villard (1860-1934) invented this type of a high voltage rectifier for x-ray tubes.Ttwo electrodes in a relatively high vacuum, one of which is a large aluminium spiral, while the other is a small flat aluminium disc do the job. By the asymmetry in the size of the electrodes, the resistance to the passage of current is much less in one direction than in the opposite one, resulting in a significant suppression of one half wave of an alternating current. The Victor Valve is similar in its internal structure to the Villard Valve. Using one valve in series with an x-ray tube cuts the inverse current and protects the tube. But the use of two valves, connected in series in opposite directions, between the induction coil and the x-ray tube was highly recommended. Cold cathode tubes, including such rectifiers harden with time, and are usually fitted with a regeneration device which could be of any type. The regeneration device can for instance be a condenser type or asbestos fiber type. When large currents were needed for instantaneous radiography, 2 or 3 valves were used in parallel, joined across in their mid-part, and sharing the same regeneration device. The Siemens and Halske catalog of 1911 shows such a triple valve with installation instructions. Very early valves can be found from "Andrews Rapid X-Ray Tube", London. 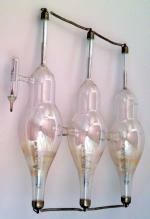 See also the Lodge rectifier valve, designed by Sir Oliver Joseph Lodge (1851-1940). Looped platinum wire external connections of the electrodes, as usually found in very early x-ray tubes. Later makes of this rectifier are equipped with dome-shaped brass terminals. These cold cathode rectifiers were later replaced by vacuum rectifying hot-cathode valves of the diode type, called Kenotrons. Saul Dushman (1883-1954) indroduced the first Kenotron in 1914 and General Electric produced it first as K3 years later.